1978. Arrowhead Stadium. Kansas City, Missouri. The Dead featured as part of the opening bill for Willie Nelson’s annual 4th of July Picnic. A single set show. And here comes Bob Wagner from the East Coast bound and determined to tape this event, and the run that follows it, mostly inspired by little more than the fact that he (and potentially all of us) may never get the chance to hear these shows on tape otherwise. On summer break from medical school, we can only thank the wheels of time and circumstance for placing Bob and the Grateful Dead in the Midwest in the Summer of 1978. And once again, he pulled out a very nice recording for the record books. To this day it remains the only circulating copy of the show altogether. For whatever reason (I’m sure we could come up with a few), this show is often overlooked. 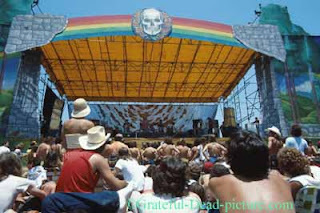 But whether it be a short show (they were one of three opening acts that day), or not circulating at all in SBD form, the Dead came to play, and the set of music they pumped out on this day is full of magic. We are very lucky that Bob Wagner managed to get this one down on tape – a true crime and loss if not for his efforts. The set opening Bertha>Good Lovin’ sets a nice mood for a midday set. And a pretty blazing Jack Straw hides in the middle of this show, complete with its explosive lead section build up. It seems to take the crowd by storm, and is not the last time in the show that the power of the music will seem to over match the more mundane circumstances of the show on paper. That the band was tapping into the heart and soul of its transformative magic, not to mention so often, and so deeply, adds a special quality to an already unique show. They seem to be playing their hearts out, like it’s the closing of Winterland or something. Probably more true was that they hadn’t a care in the world and were just having a ton of relaxed fun. After hardly more than a handful of songs (and a sweet Friend Of The Devil among them), we reach what can be considered the second set portion of the single set show. What follows is a passage of music firmly locked into the moment, with multiple facets of sparkling light like a diamond turning in sunshine. In ways that are difficult to explain in words, Terrapin Station oozes with energy like a call to worship. Somehow, in its coming directly on the heels of two cowboy tunes, its natural juxtaposition seems to beckon you from across the stadium to settle in close to hear a story. As if the countless leaves of a tree are all hands drawing you to its roots, there is a silent mystery about the song. We are no longer just sitting in the sunshine digging a rock and roll show. Something more is taking form. Terrapin’s small solo section before the “Since the end is never told” section catches more psychedelic energy than most other Terrapins I can bring to mind. Bobby and Jerry work some really fine interplay as they bounce the song's thematic melody off of each other. Eventually Bobby pulls himself one beat behind Jerry, echoing him, and the effect is gorgeous. It becomes more difficult to judge to true start of the measure. And with that, subtle lights and colors begin to take form in the otherwise normal air around you as the wheels of rhythm patterns begin to mesh and disconnect at the same time – like a dance of miniature star systems floating like dust in daylight. This is very brief, but equally gratifying. Playin’ In The Band stretches out into the July sky, opening the stadium up beyond the parking lots, the city, state, and even the shores of the oceans in either direction. A higher than normal energy ride (perhaps the band was trying to pack in as much as they could into their timeslot), they swirl slow twisting winds into gusts and electronic stampeding somewhat quickly. Before it’s over, things slip almost completely and wonderfully out of bounds with only the drummers holding down anything remotely related to music moving forward in time. Spacey vibrations blur vision and eventually give way to Drums. This leads into Space - the band now taking the crowd in attendance down twisted damp and dusty caverns of caves that are still forming before our eyes. Passages appear and disappear as soon as you to step forward. Eventually, Jerry leads us to some light at the end of a tunnel into Estimated Prophet. As the sound of chaos slowly fades in the distance behind you, the song appears. In the Estimated jam, Jerry becomes very expressive. Not only does he let his running lines scale the small hills and valleys around us, but he leaps into the air from time to time to traverse the clouds and sunshine directly. He’s playing “big.” In doing so, you can feel the music’s power take form, settling into the zone which typified a better than normal experience with the Grateful Dead. Eventually it feels like we are getting far more magic than we deserve from some odd venue, opening act single set version of Estimated Prophet. But it just keeps on coming, the entire band delivering more and more of the precious stuff. For me, as I listen to this, I can help but gain an extra level of delight in knowing that this pure moment is buried in a show that gets very little press. I love that I could have forgotten about something so magical, and then found it again. If you’ve heard this show in the past, and somehow just put it aside, you will know exactly what I mean here when you listen to the Estimated. And it doesn’t let up at all as the music moves along into the next songs. As things progress the entire band begins to drive the intensity in a more and more tightly would ball of energy, arriving shortly thereafter in Other One. This Other One exhibits a fluidity that courses nimbly over the senses. Like rapids rampaging downhill, the momentum builds quickly and Jerry is careening his notes into towering heights which bend and twist the music along. The band sounds very locked into the moment, seeming to relish their ability to whisk the daylight-soaked crowd of onlookers fully into their corner of the galaxy. The only drawback is that it feels like the band is sensing the press of their opening timeslot. We arrive in Wharf Rat much too quickly considering the fact that the band is obviously dialed into the zone, leaving behind an Other One that could have grown to mythic proportion. However, this Wharf Rat is fabulous. Right out of the gate Garcia’s solo is full of tremendous peaks, his notes emanating out from the depth of his soul – an outpouring of emotion. It grows, subsides, then builds again into a rampaging passage of shredding guitar notes – massive and threatening enough to nearly disrupt any ability to remain grounded to the physical plane. The final verse comes and goes, and the music heads right back to this sense that chaos could overtake things at any moment. Wonderful stuff. They close the set ferociously with Around & Around and Johnny B Goode. This serves to bring the crowd back down to earth and demonstrate the band's ability to please all comers with good old rock and roll. No one goes away unhappy. 1978 often pales due to its proximity to 1977. But like 1976, ’78 offers some truly inspired playing just waiting to be discovered by somewhat more intrepid explores of the Dead’s musical archive. 07/01/78 is a shining example of just this sort of discovery. Enjoy! I met a feller while hitch-hiking through KS back in '82 or so who told me about this, his one GD show (people's 1 GD experience was a common topic of conversation when they found out I was a Head). He'd been quite impressed. I'd seen Willie open for the Boys the following September, so it didn't seem too great a stretch of the imagination, still, it's great to learn that his story was true. BTW, that pic at the top of the blog is pretty but misleading, while I wasn't there I can say with confidence it is not from this show. Does anyone know what show it is from? The pic is from 06-04-78. If you hold your mouse over the image you will see it is labeled as such. Thanks for coming by to comment. Glad to have you here. there was at least one other aud taper for this show. Thru a Relix trade I had a copy back in the early 80's. The quality was abysmal though, I'd rate it as a D. I didnt keep it, glad now to find a much better source recording. Thanks! My Dad was the promoter of this show, man I wish I was alive at the time. It sounded like a wonderful event. I'm so happy to have found a recording it. Moved from SF to KC that June. (CULTURE SHOCK IN 1978!!!!) I couldn't BELIEVE my good fortune! Willie's Luckenbach Texas Picnic actually MOVED to a couple of miles of my apartment AND dragged the Dead in there with them? 50000 guys in bib overalls who didn't know the Dead from squat couldn't be wrong. The Dead blew everyone but Willie off the stage. You call this a SHORT set and for the Dead it was. But it's length--more than two HOURS--was enough, with the typical Dead delay in starting, to permanently damage Jerry and Willie's friendship--they never played together again. Nobody else besides Willie played longer than an hour and the Dead were not supposed to either. Missouri was the local group that played that day and their guitarist told me this years later. There were more than three opening acts. Waylon Jennings, Tom Paul Glaser, Jesse Colter, Jerry Jeff Walker, Missouri and maybe others I have forgotten. Be that as it may, all these guys around us who didn't know the Dead were amazed. I remember it as a fine, if tailored to the crowd, set. Their pure musicianship turned everybody around. It made my culture shock transition more manageable, but to this day Kansas City is one town where conformity is the order of the day. It may seem like a short set to us, but Willie Nelson was NOT happy with its length and it caused a permanent rift--and put things mighty late. There were many more than three opening bands. But the over-all-ed rural folk there had no IDEA what hit them. The Dead earned some serious redneck love that hot summer day. My neighbors asked "who ARE these guys?" EVERYBODY was awestruck--everybody except Willie, the pro's pro.